A total integration time of 7 hours in 600s subs from 3 nights. 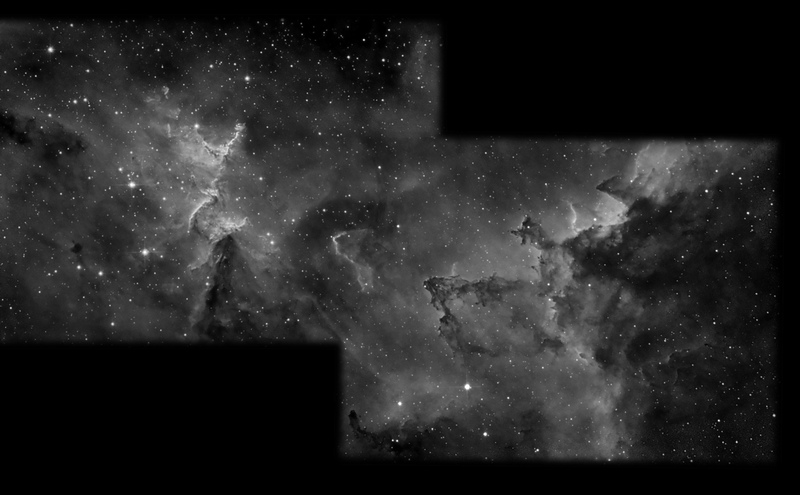 A two frame mosaic of the central region of IC1805. This is my first hydrogen alpha mosaic. The joining up is a little rough, and could perhaps have more work, but overall quite a pleasing result. I'm not going any further with this: IC 1805 is now poor placed because it transits so early. It might be possible to get a third panel of the mosaic, but there are many many other targets on my list. Captured in ArtemisCapture, calibrated in ImagetoolsCa, DDP in maxim, thuggery in photoshop.